As homeowner we remodel our home because we want to upgrade older fixtures to something more modern, put in newer flooring that matches our taste or freshen up the look of our home with new doors. Sometimes though, when we are ready to sell our home we think that remodeling will increase the resale value of our homes. That is not always the case, some improvements can have the opposite effect and hurt a property’s market value if not properly researched. The best places to improve are not always kitchens and bathrooms. Instead, consider a new garage door as you can see up to a 92% ROI and installing a steel entry door, you will see almost a 91% ROI. Kitchens and bathrooms are still good, but remember to try and appeal to a wide audience and not on how you think it should look, current trends or suited to your taste. Homeowners that intend to sell their home should consult with a Realtor to ensure that the renovations do not price them out of their neighborhood or may not provide the homeowner a return on their investment. As much as interior improvements seem like the best place to invest to appeal to buyers; honestly, I would say your roof is number one. If the roof is old, at the end of it's life, or in need of repairs - this will deter many potential buyers. 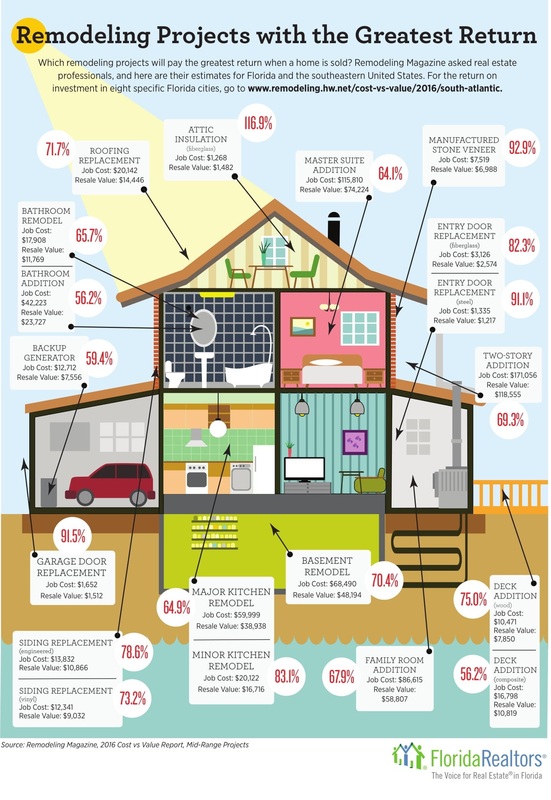 Buyers are afraid of having to do a lot of repairs and maintenance to a home and want the basic systems to be in great condition. For most buyers, knowing that the roof needs to be replaced is a much bigger issue for them than living with a functional but outdated, kitchen and bathroom.